Hey there! Hope you're well and enjoying your weekend. Here at the Quirky household we've been indulging ourselves binge-watching Dexter. We had never seen one episode, but the Olympics just weren't floating our boat. So we started our little adventure learning all about serial killers. Now we are in season 5 and I am dreaming about it at night. That means I should stop watching. But I probably won't. It's such a great opportunity for massive Pinterest and Tumbler fun! In the meantime I've been doing a little painting and stuff. 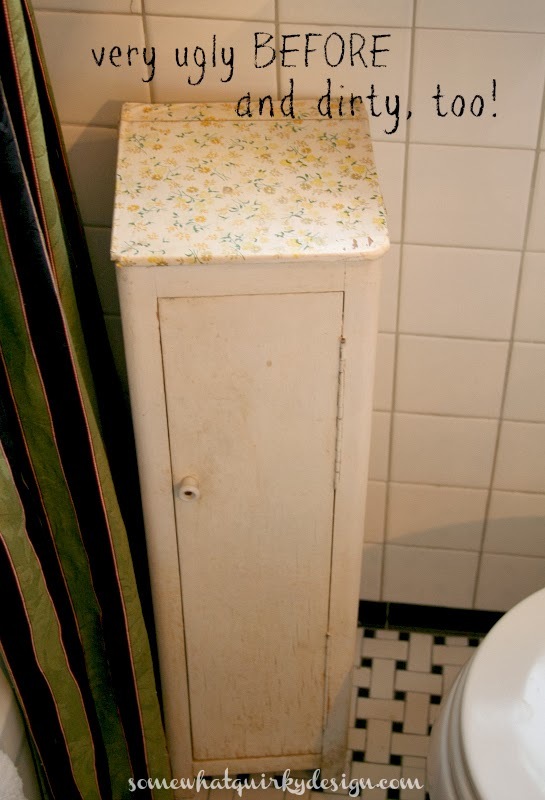 I've been looking for ways to get storage in my bathroom. It's really miniature and while I've added some over the door and window shelves there is no storage other than the medicine cabinet. 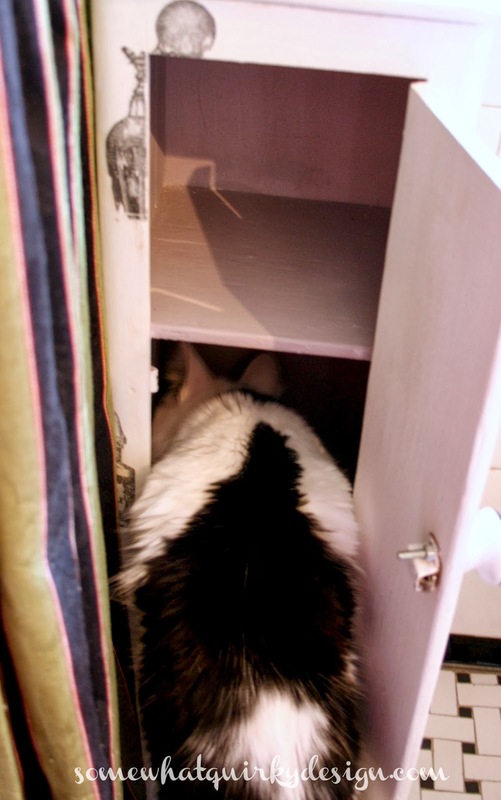 Lately, I've grown increasingly tired of going in and out of the cabinet 6 times just to do one thing. I know that could mean I'm lazy. But I think it is more likely that opening and closing the door over and over again just reminds me that I need to do something about the storage. I found this REALLY ugly and dirty cabinet tucked away in the corner of the basement at an estate sale. I thought maybe it would be small enough to tuck in somewhere in my bathroom. Don't you love the contact paper over the top? It was on the shelves inside as well. I cleaned it up and painted the exterior with Maison Blanche paint in Magnolia. Then painted the interior with Annie Sloan Chalk Paint in Paloma. Then I used Miss Mustard Seed Hemp Oil on the interior to seal the paint. I wasn't interested in waxing the interior. It is just too small. I wanted to decorate it with some type of black and white transfer so I headed over to The Graphics Fairy to find something. 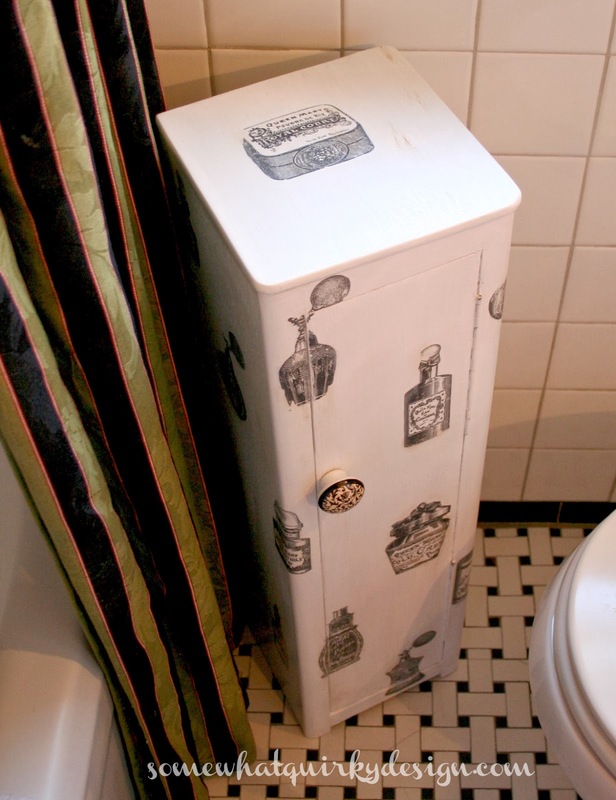 I settled on prints of vintage toiletries and perfume bottles. I used Photoshop to adjust the sizes, reverse the image, and print them out. Then I took them to a copy shop to make lazer copies so I could use the reverse transfer (ModPodge) method. I thought I would do a little tutorial for those of you that don't know how to do this already. A lazer print of your image. If it is directional (like words) be sure to print out reverse image. Something to put your image on. 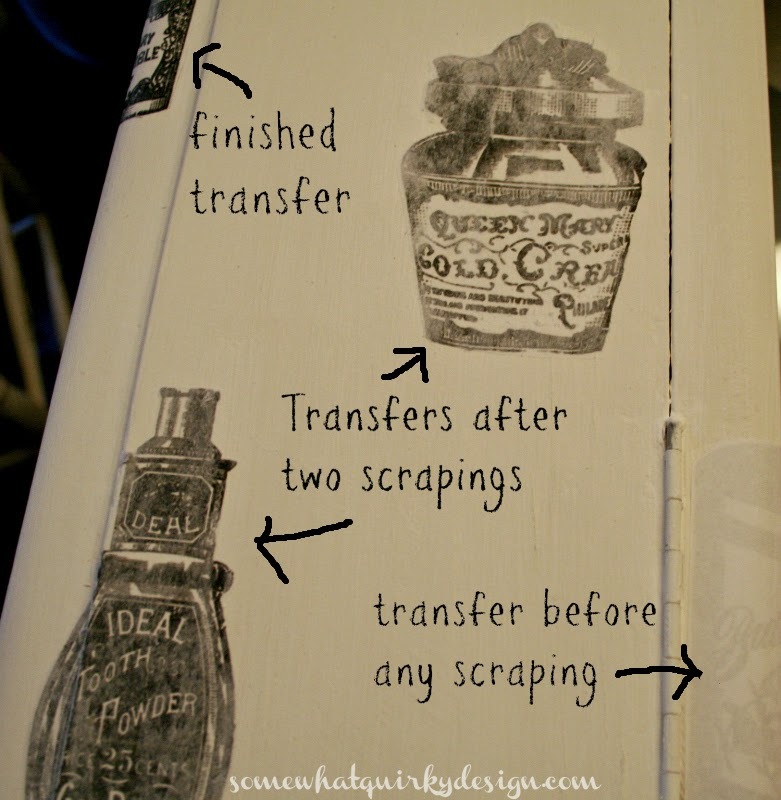 Spread a medium coat of ModPodge on the FRONT of the image. Place the image on the item. 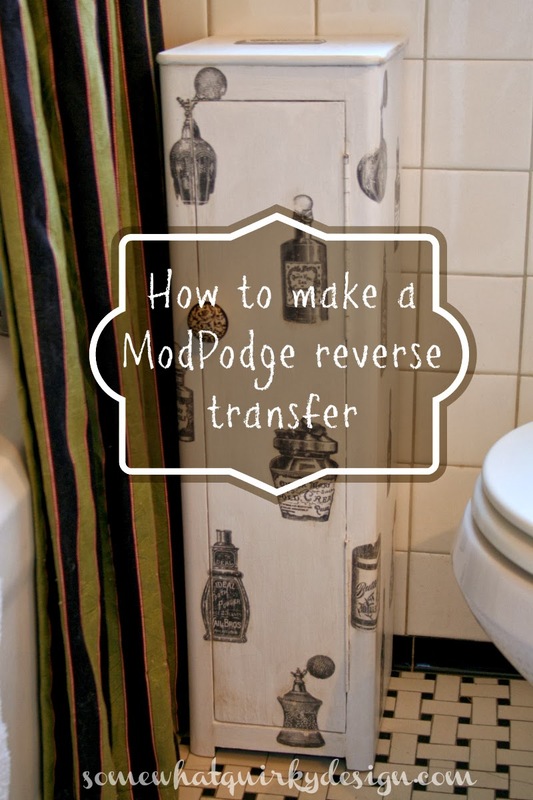 Press out any bubbles and wipe away any excess ModPodge. Let transfer(s) dry at least 6 hours. 8 is better. When transfer(s) are completely dry spray or sponge with water so that the transfer(s) are wet but not dripping. 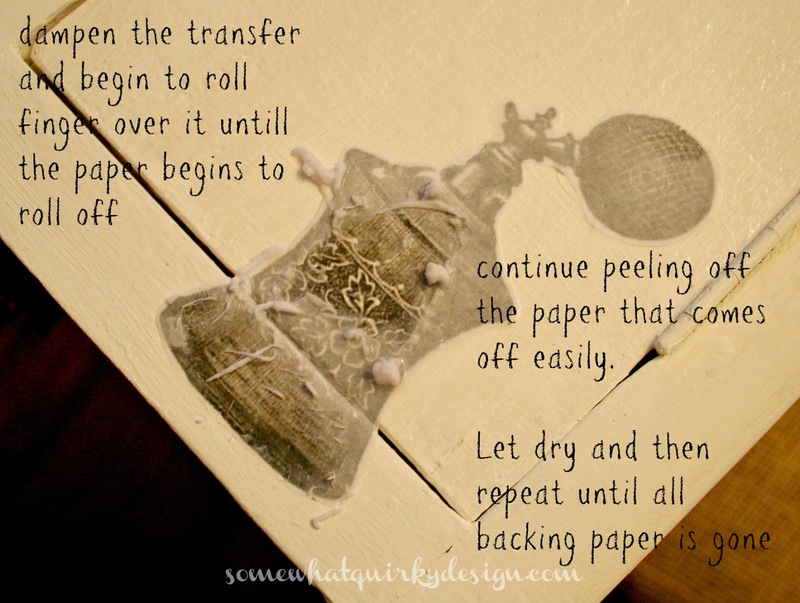 Rub your finger over the wet paper gently so that it begins to roll off the back of the transfer(s). Move on the the next area(s) and do the same thing. Let each area become dry again and repeat the pealing until all the white backing has been removed. Your next step depends on what method you are going to use for sealing/protecting the piece. If you are waxing you can just wax over the transfer and that can be it. If you are using any other finish you will want to seal the image with ModPodge before you use the finish. If I am looking for a harder finish than wax I always use Deft Clear Wood Finish. I've written about it many times. 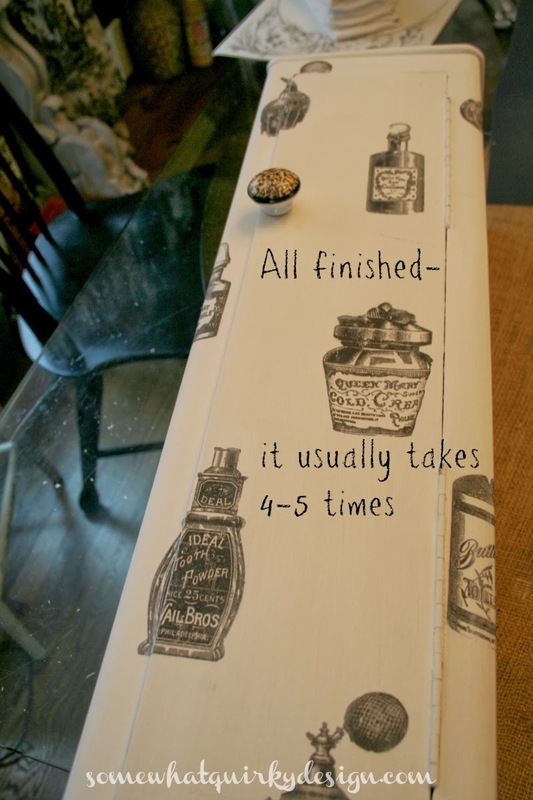 I've used it on decoupaged furniture a starting 10 or more years ago and the furniture is still in great shape. For now I just waxed this cabinet, but I may seal it more later depending on how it holds up in the bathroom. All the work on this piece pretty much destroyed the rotted areas on the back "legs" so I had to cut a couple of inches from the bottom of the cabinet. It's still a little wonky so I will be putting some sort of legs on it to try to balance it out. 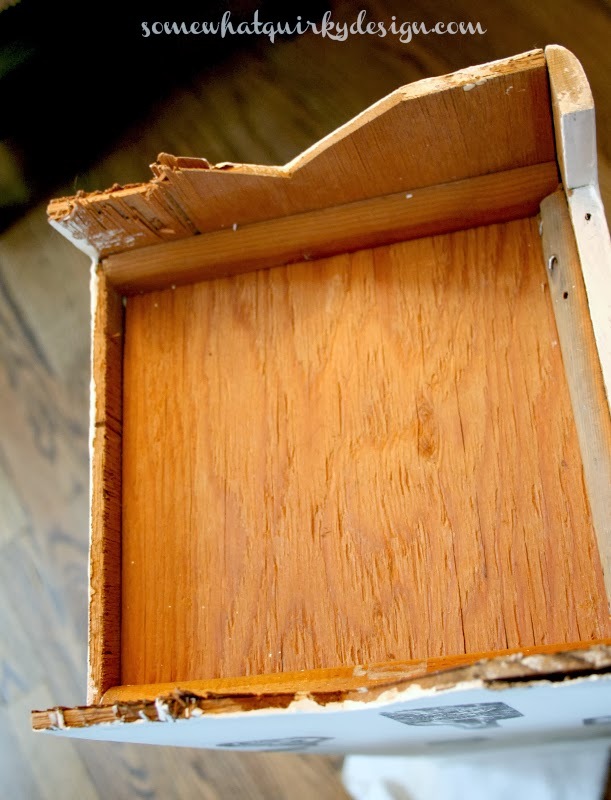 Remember how I said I used hemp oil on the inside of the cabinet? I have found that my cat, Sammy, loves hemp oil. It won't hurt him, but it's a little annoying that he wants to lick everything I put it on. He also licks the bottle, the brush, and the dish I pour it in. So be careful with your hemp oil folks! I wish that I had sized the transfers a little bit smaller, and I'll probably change the knob again, but overall I think it's kinda cute! And yes, it does crowd the corner there and no, your knees don't fit when you sit on the pot. But it's worth it to have that little bit of storage beside the bathtub. Sammy was a little put out that I showed you his back end and he wanted a head shot. So in the interest of good cat relations. Here's Sammy! Very cute!! One of these days, I'm going to do the whole "image transfer" thing. Definitely looks better now! 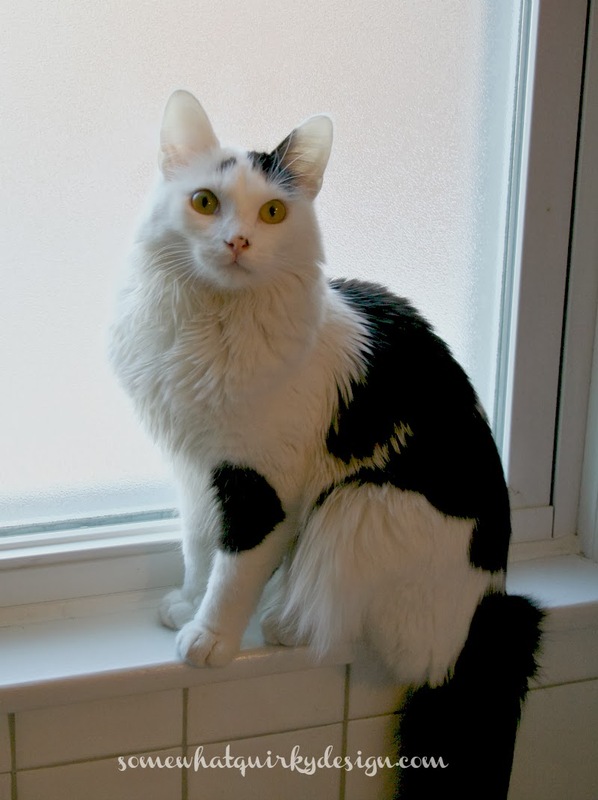 Sammy looks like a skunk in that picture! Oh...and i'll be checking your trunk a little more carefully next time you come if you are into Dexter these days. The knives were bad enough! If I find a roll of plastic...you're not coming in!! LOL! I'm going to have to give this another try since I failed the first time with this type transfer. But seriously, move it so you can sit comfortably on the pot. It looks great, the size of the transfers look pretty perfect too. My dog tries to lick me when I've put cream on, or he tries to lick the soapy water off me after I've had a bath, what is it with animals and products ! What a cute little cabinet, now! I like you have a very small bathroom, small is probably generous in describing it's size. Storage space is always a problem. Right now using a very small bookcase in there! I love the transfers, make it look very charming. Since I've never tasted Hemp oil I'm uninformed about the taste but maybe should give it a try! The cabinet is really cute. Isn't it funny how cats love oil? Sammy is adorable and it was nice to see his face! How cute ( I have a file with graphic fairy images in it - and these perfume bottles are a part of it ) what a great graphic to use for a bathroom cabinet! Cute, cute, cute. 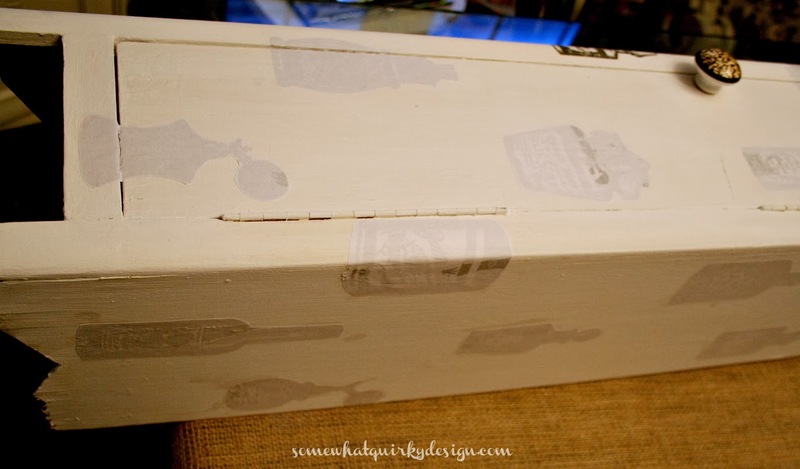 I love the reverse mod podge method. It's my favorite and truly the cheapest method around, but it delivers in spades. That cabinet is adorable. I love the images you chose. Sammy is handsome frontwards and backwards. Kudos to you for recognizing how fantastic this little cupboard could turn out. Sammy digs it... I wish I could offer something wise about why cats wish to lick on things. I don't.